Wildly popular on tour and amongst amateurs, these high-tech grips are worth every penny. The flagship grip from the top brand in golf grips, they’re durable, tacky, and great feeling in all weather conditions. The grip is the conduit between your body and the golf club, so it’s worth it to spend a little extra for the best. 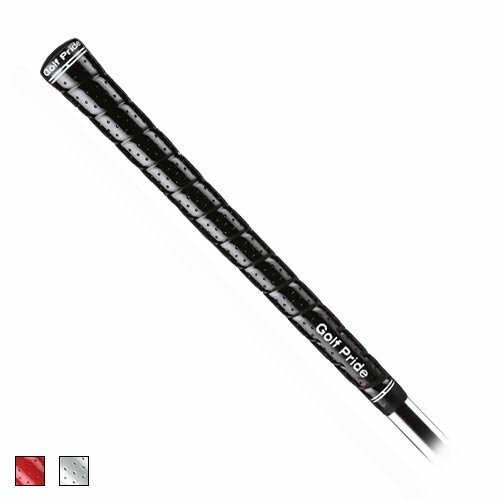 1.11.1 What are the different types of golf grips available? 1.11.2 Should I buy a firm or soft grip? 1.11.3 Should I buy a round or ribbed grip? 1.11.4 Are grips water resistant? 1.11.5 When should I be replacing my grips? How long does a typical grip last? 1.11.6 Should I buy a complete grip set for all of my clubs or individual grips? 1.11.7 How do I properly maintain my grips to make them last longer? 1.11.8 How do I change golf grips? Excellent performance, excellent value. Multi-compound technology that brings softer feel. Perfect for rainy weather too. Classic feel, with updated technology. Looks and feels like a classic leather grip, but made of modern tacky rubber. This is our most durable grip. While not as durable as the other options, it has great shock absorption, eye-catching colors. Amazing performance in dry and rainy weather. Grip with a super firm feel. Lots of design options. Best grip for most people. High performance grips in a Midsize format that helps reduce hand action. Perfect for players with normal or large hands. Cheaper option that is not as good under rain. Ideal for people that want can play with thinner grips. Overall good quality. Golf Pride Multi-compound grips are top performers in every category. They feel amazing, with a soft tackiness underlaid by a firm, confidence-inspiring and responsive feel. The cords don’t tear your hands up like old corded grips often did, and the updated multi-compound rubber that Golf Pride has developed is both very durable, and performs very well in all weather conditions from a cold rain to a hot, dry desert day. The Golf Pride brand has set the standard for rubber grips since their inception in the 1940s, and these multi-compound grips are the flagship of their line for good reason. They’re brimming with technology and performance to match. As long as you can fit these into your budget, you’ll likely find these to be among the best grips you’ve ever used. The exceptional performance and tech make them my Top Pick. The Golf Pride Tour Wrap 2G is a modern, high-tech version of a classic design. It’s as tacky as grips get when first installed. While performance in the rain is improved over the first generation of the Tour Wrap, you’ll still want to keep a towel and rain gloves handy as the Tour Wrap 2G can get slippery when wet. These are elite grips for elite players. They’re nice and tacky and provide an unobtrusive, unassumingly good feel. There are no lines to help with alignment, so you should be comfortable that you can aim properly without any aid from your grip. This is my upgrade pick, for when you’re starting to get good and you want to use the grips that scratch golfers tend to favor. Winn is a company known for golf, fishing, tennis and bicycling grips. Because they manufacture grips for a number of different uses, they’ve developed innovative technologies that are useful across many different situations. Perhaps because of their research in fishing grips, the DriTac grips are some of the best performing wet-weather grips I tested. They’re incredibly soft and have a slick look that seems like they’d fly right out of your hands in the rain, but the opposite happens: they actually seem like they get even more grippy when it’s raining out. Beginner golfers will appreciate the alignment patterns in the Winn DriTac grips, which naturally guide the hands to the proper places to ensure the clubface is aimed properly. They have a lovely, soft feel but this causes them to wear out faster than some of the other grips I tested. This is my budget pick for a tour-quality grip at a price that’s friendly to the wallet. The Champkey AVS grip set is my Top Pick for grip sets, as it combines the quality and design of the Winn DriTac grip with a price that’s extremely easy on the wallet. Performance-wise, it’s a nice firm feel and holds up well in rainy weather. It’s got by far the most options for colors and patterns, whether you want to keep it simple with a black grip or bring some neon green into your game. For a not very well known brand, the Champkey grips seem to be very well-manufactured and deliver high quality performance in all weather conditions. Their durability is not the best, but with proper care and cleaning they should last you through a busy golf season. 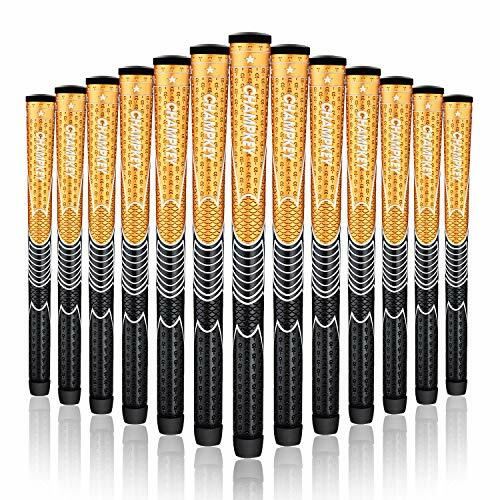 The The Winn DriTac AVS Midsize golf grip is my upgrade pick, as it’s one of the best grips I was able to find in a discounted 13-grip multi-pack. Winn has a lot of use on tour and many golfers swear by their grips. They’re quite soft and have great design that helps players of all levels ensure correct alignment. As a mid-size grip, they’re designed for players with larger hands or players who tend to flip their hands and hit a snap-hook. The Karma Velvet Midsize is my Budget Pick for 2019. At under $2 per grip, it’s hard to find a better deal anywhere! The grips are on the skinny side, which causes them to be a bit difficult to install. They’re a very firm feel, so if you have a tight grip and want a softer feel, you may want to look elsewhere. The look is classic and clean, inspiring confidence. But for the price, these are hard to beat! If you play a lot of golf and change your grips out frequently, you’re aware that the costs can really stack up. At this price, you can afford multiple grip switches per season. They’re also great for practicing DIY grip installation, as it doesn’t matter if you accidentally ruin a grip or two during the learning process. 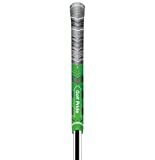 The Golf Pride New Decade Multi-compound MCC Plus4 grip is one of the most technologically advanced grips on the market, featuring different materials under each hand to help the golfer make good contact. The thick diameter under the lower hand is designed to help reduce hand action and keep the clubface pointing right at the target. The soft rubber is combined with proprietary Golf Pride compounds to provide top notch feel and long lasting performance. These are some of the best-performing grips in the rain that I’ve ever used. I didn’t even need to switch to rain gloves and I still felt very confident with the tacky feel. The alignment aids are designed to put your top thumb in the middle of the grip for a neutral, square grip. One issue with this is that I find a lot of beginners tend to hit a slice and thus need to take a stronger (draw-focused) grip, with the top hand rolled over the top of the club more. If you do that with this grip, the alignment design will feel just a little bit off. It can take some getting used to, but it’s not a deal-breaker. Our Verdict These grips use the latest technology to perform at the highest level in any weather conditions. Many corded grips have rough cords that’ll tear up your hands, but these cords are soft brushed cotton and didn’t cause any problems for me. Of course, with the technology and cutting edge materials involved in manufacturing multi-compound grips, these are among the more expensive grips on the market. However, I feel the extra cost is justified by the superior performance. The Golf Pride Tour Wrap 2G improves on a classic Golf Pride wrap design with even more tackiness and durability than the original. The original Tour Wrap was designed to give the look and feel of the leather wrap grips of yore. While it appears to be a slim strip of leather wrapped around the shaft, it’s actually a single piece of rubber designed to replicate the leather look but perform in a more effective, modern way. The glossy grip looks great whether you go for the classic black or the flashier modern-looking white. These feel very sticky at first, to the point that some golfers are distracted by how sticky and tacky they feel. I found it to be a good blend of firm feel and a high level of tackiness, allowing me to grip the club softly with no fear of twisting. There are no alignment aids on the grip, so these are aimed towards more experienced players who don’t need any guidance in getting the clubface squared at address. They can also be a bit slippery when it’s raining, so make sure you keep a towel and some rain gloves handy or you may send your clubs flying. Our Verdict These are time-tested and tour-proven grips that give a firm, tacky feel and last as long as any grips on the market. They’re elite grips made for elite golfers. 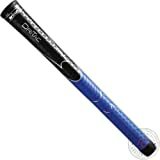 The Winn DriTac grip is a popular alternative to Golf Pride grips due to its unique, soft feel and excellent vibration dampening. If you hit a lot of thin shots, you know well the pain that your hands can experience from the vibrations reverberating through the shaft. These Winn grips do a great job of dampening those vibrations and keeping your hands fresh and comfortable, even in cold weather when it’s extra painful. The Winn DriTac feels so good when first installed, I found myself constantly grabbing the clubs just to feel the great, soft tacky feel of the grips. They’re made with a unique polymer that makes the rubber very soft but also very effective in wet, rainy conditions. I found no difference in grip quality whether it was rainy or dry. However, when it was particularly hot out, the grips started to feel almost overly soft and mushy, and I felt myself gripping the club too tightly for my liking. They also started to show wear very quickly, and felt like they’d definitely need to be replaced every year. These are great grips for beginners, as they have a very effective patterning to help make sure the hands are placed properly on the grip naturally, and they reduce the shock of painful mis-hits. More experienced golfers and golfers who play a lot may want to look into a firmer, more durable grip. Our Verdict Winn recommends storing the grip in an air-conditioned room, so make sure you’re not leaving your clubs in your car between rounds. Overall, these are great grips if you play in cooler weather or are looking for the softest feeling grips on the market. They’re available in several bright, eye-catching colors as well. The price is certainly right for the Champkey AVS Soft golf grips set. You can regrip your whole bag for under $5 per grip, which is hard to beat! The Champkey AVS Soft grips look identical to the Winn AVS DriTac grips: they have a similar glossy look, as well as the same alignment patterning. I’m a big fan of this alignment patterning. It helps your hands naturally form a technically sound grip but still allows you to open or close the clubface if you’re trying to hit a specialty shot. Looks aside, the Champkey differs from the Winn DriTac AVS grip in that it is not quite as soft as the Winn grips, and it doesn’t dampen the vibrations of mis-hits as well. The feel is nice and tacky, but very firm and responsive. You’ll know if you striped the ball or if you caught it a little thin, as the grip transfers all of that info unfiltered to your hands. If you play in cold weather, you’ll probably want to find something softer or your hands might be stinging after a poorly struck shot. The designs and colors available are as varied as I’ve seen, from American Flags to bright green to bright red. You can also go for a classic black or an old-school brown that harks back to old-school tanned leather grips. If you like to stand out from the pack on the course, these are the grips for you. Our Verdict The Champkey AVS grip had similar durability issues to the Winn AVS grips: I found them starting to wear down quickly and I’d recommend changing these every year at the least. The Winn DriTac AVS Golf Grip set are as soft as you’ll find on the golf grip market. If you have a tight grip and like a nice, soft feeling grip with great vibration reduction, these should be right up your alley. 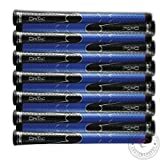 This grip set is comprised of either 9 or 13 of the grips, with the set of 13 being the best deal — often coming in at under $6.00 per grip. For golfers who change their grips frequently, that’s a price point that leaves you with more money left over for greens fees. 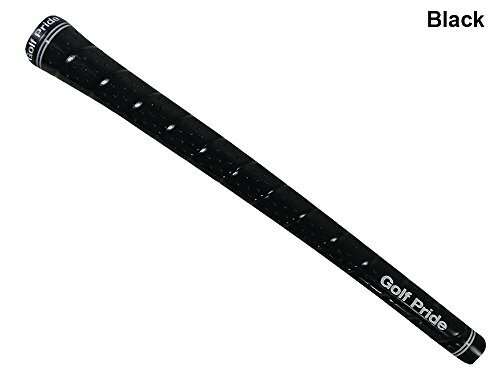 These mid-size grips are ideal for players who use either a Mens size Large or XL golf glove, or for golfers whose primary miss is a bad hook. Hooks are often caused by too much hand action at impact, and the extra 1/16” of diameter of a mid-sized grip seems minor but it can make a big difference in quieting your hands. The quieter your hands are through the hitting area, the more likely the clubface is to be square to the target line. Our Verdict Winn DriTac technology, as you may be able to guess from the name, maintains a dry and tacky feel in all weather conditions. Whether you’re dealing with morning misty fog or a driving rain, you should be able to maintain a good grip without the club slipping in your hands. If you need new grips but all the others we’ve mentioned are out of your price range, the Karma Velvet Midsize 13 Piece Grip Set might be the answer. At under $2/grip, any golfer can afford to put a whole new set of grips on their clubs. So how do they perform? As you might expect from grips at a much lower cost than the others, the materials used are cheaper and thinner than other grips. This causes a little bit of flimsiness that makes installation difficult, but use plenty of solvent and they should slide on OK. The thin material also makes the grips feel rather firm, as there’s simply not much rubber between your hands and the golf shaft. However, the tackiness is surprisingly good and the grips handled wet weather fairly well. 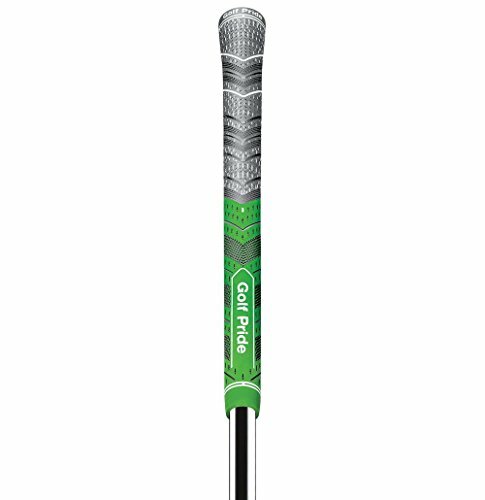 The feeling overall is similar to the Golf Pride Tour Velvet grip at a fraction of the price. 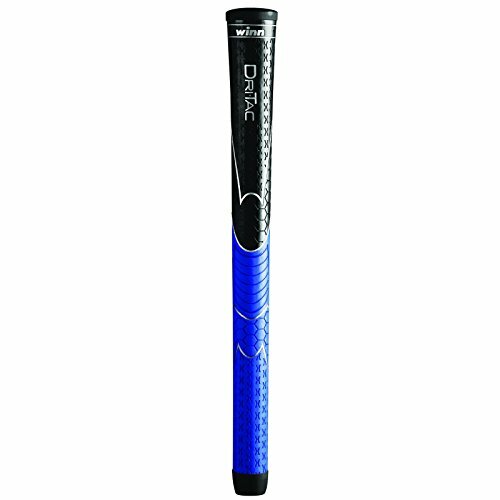 The Tour Velvet is the most used grip on tour, with an unassuming design that lets better players simply do what they want with a good, solid feel and not much influence from the grip. You won’t find extensive alignment tools or flashy looks, just a clean, classic look and feel that lets players play. Our Verdict The Karma Velvet grip is a decent iteration of the Tour Velvet design. While it’s not the best choice for beginners, intermediate and advanced players may find that the Karma Velvet provides comparable performance to its more expensive counterpart. Golf grips have come a long way from the early days of golf, when wool was wrapped around hickory golf shafts and gutta-percha balls were the norm. Grips are now primarily made of rubber and are manufactured en masse, so you can have identical grips on all of your clubs — perfect for providing consistent feel across the whole bag. What are the different types of golf grips available? All golf grips have to conform to a basic set of rules: all grips (except the putter grip) must have a circular cross-section and the same cross-section shape along the entire grip. They must taper from thick to thin and cannot have “waists” — thick sections surrounding thin sections — or bulges. However, within those rules, there are numerous different styles to choose from. Virtually all grips nowadays are made of rubber, though some may have additional compounds added to help in various conditions or to provide different feels. After wool grips fell out of fashion, leather grips were the norm for a short time. But upon the founding of Golf Pride in 1949, the rubber grip revolution had become. The Golf Pride rubber grip is still the most popular grip on tour and amongst amateurs, and they offer numerous different styles within their general product line. Cord grips are rubber grips with a brushed cotton fiber sticking out of the rubber, giving a coarse texture and offering moisture-wicking characteristics. Cord grips are available in a full-cord style, which has the cotton fibers inserted throughout the entire grip, and half-cord style, wherein the cord is only laid into the back half of the grip, opposite the thumbs. Cord grips are either loved or hated by most golfers. Some find them unnecessarily abrasive and feel the rough texture of the cords only serves to give blisters and rough hands. Others love the moisture-wicking action of the cords and feel like the extra rough texture allows them to hold the grip more softly without fear of the club slipping. Whatever your preference, cord grips are typically among the fastest to wear out. The cord material absorbs moisture and oils from your hands. That moisture and those oils travel into the rubber of the grips and accelerates the breakdown of the rubber, and the cords can become smooth and ineffective over time. If you use cord grips, you should be prepared to replace them more frequently than a basic rubber grip. However, if you tend to have sweaty hands or play golf in a humid environment, you may find cord grips to be a real lifesaver on the course. Historically, wrap golf grips were made of thin strips of leather wrapped tightly around the top of the golf shaft, much like old tennis club grips. 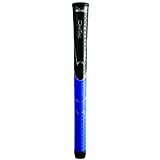 This style of golf gripping has fallen out of style, but wrap-style grips are still available from Golf Pride (the Tour Wrap Grip) and Winn (the Winn Excel Wrap Grip). These “wrap” grips are actually one-piece rubber grips, but they are styled and textured to feel as if they’re the leather-wrapped grips of old. One advantage of a wrap grip is that you can rotate your hands on the grip and it will still feel the same, as it’s got the same texture around all 360 degrees. If you open the clubface to hit a flop shot, or rotate the shaft to change the loft on your adjustable driver, the grip will still feel the same. It also is easier to install properly as you don’t have to worry about the alignment of the grip as you might need to do with others. Lightweight golf grips are made of rubber but, as you can probably guess from the name, are lighter than traditional grips. Golfers looking to eke out every little bit of extra swing speed they can find would find lightweight grips right up their alley. Most players find that the lightweight grips feel a bit awkward as standard weight grips provide just enough counterweight to feel the head properly through the whole swing. Lightweight grips are useful for senior players and players with slow swing speeds who need all the help they can get to generate more distance. Putter grips differ from regular grips in that they’re typically not simple, round grips that taper in thickness from top to bottom. For a long time, most putter grips had a flat front where the thumbs anchored, and thick tops tapering to thin bottoms. In recent years, the putter grip market has positively exploded. Korean golfer K.J. Choi, a PGA Tour pro with quite a reputation as a solid ball-striker and constant tinkerer, was the first to use an oversized SuperStroke golf grip. When he quickly saw success with several tour victories while using this grip, other golfers took notice and began to try out the over-sized grips. As more and more players started using the SuperStroke grips, other manufacturers took notice: now, Golf Pride, Winn, Lamkin, and other manufacturers all offer oversized grips in all sorts of shapes and sizes. SuperStroke has expanded its product line with midsize and “slim” grips that are smaller than the original over-sized grips but still larger than old-school putter grips. 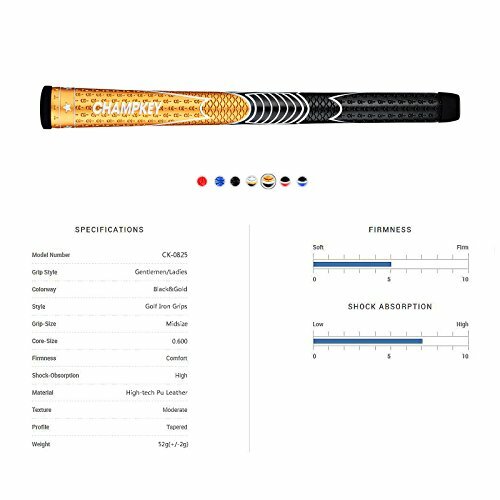 Should I buy a firm or soft grip? The softness of the grips on your club will ultimately come down to personal preference: whatever grip makes you feel confident is the grip you should go with. However, a general rule is that people with a tighter grip should go with a softer grip, whereas people who grip the club very lightly with minimal pressure should go with a firmer grip which will feel more secure. The climate you play in might make a difference too: if you play in very hot desert weather, soft grips may become too soft and feel overly mushy in your hands. Hot weather players often prefer medium-to-firm grips as they will naturally soften in the oppressive heat. Should I buy a round or ribbed grip? Some grips are available with a rib through the spine that’s intended to help you make sure you’re aligning the clubface square to your target line. These are intended for beginners who aren’t sure what a square clubface looks like or any player who has trouble getting the ball started on line. The great majority of grips, however, are round and don’t contain any sort of ribbing. Most golfers will occasionally want to open or close the clubface slightly to help control spin, curve, and trajectory. Having a spine through the grip can feel very awkward when the grip is rotated and the spine is no longer in the correct place. You also have to be very careful when installing spined grips to make sure they’re aligned properly and aren’t twisted at all. Unless you’re an experienced grip installer, I’d suggest having a professional install your grips for you if you elect to go with spined grips, as even a slight mis-alignment can cost you strokes on the golf course. Generally speaking, the newer the grip, the better it will perform in wet conditions. However, as mentioned above, some grip technologies are specifically designed to perform better in wet environments. If you play in a lot of humidity or on rainy days, half-cord or full-cord grips will help provide more tackiness when it’s damp. You can also rub sandpaper on your grips to increase their tackiness and provide a rougher surface that’s easier to hold onto when it’s wet out. However, all grips are subject to becoming slippery in rainy conditions. Rather than worrying about finding a waterproof grip, I’d suggest investing in some high-quality rain gloves. These gloves from FootJoy actually perform better once they get wet. Several golfers I know who tend to have sweaty palms use these gloves even when it’s not raining as they’re the best way to ensure a firm grip despite rain or sweaty hands. When should I be replacing my grips? How long does a typical grip last? Many golfers go way too long between re-grippings. Since grips lose tackiness slowly over the course of many rounds, you may not notice how much more slippery the grips have become than they were when they were brand new. Even if your grips feel like they’ve got some tackiness left, you’re probably still tightening your grip just a little bit too much if you’ve gone more than 40 or 50 rounds since your last re-gripping. Most tour players play so much that they re-grip their clubs every 2-3 months! 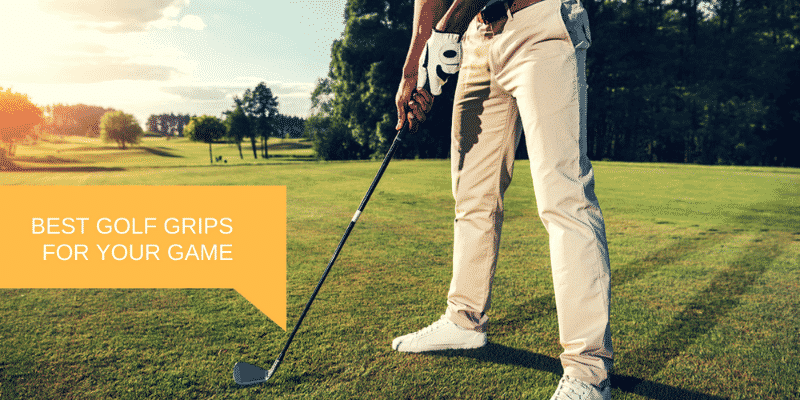 The general recommendation is to re-grip your clubs every 40 rounds, or every 30 rounds if you also spend a lot of time practicing and hitting balls on the driving range. 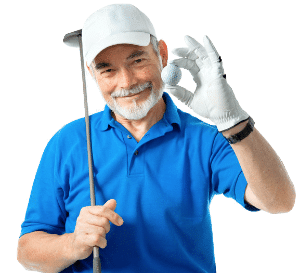 Even if you only play ten times per year or so, time can age your grips as the oils from your hands penetrates the rubber and the heat of storage in a garage or car trunk will slicken the feel. I always suggest a new set of grips at the beginning of every year. There are few better moments in golf than heading out for the first round of the year with brand new, great-feeling grips. It sure beats getting to the first tee and having your driver fly out of your hands! If you’re lucky enough to play several times each week and spend an hour practicing on top of that, it’s a good idea to re-grip your clubs at midseason as well. It’s one of the least expensive ways to refresh your equipment and ensure you stay at top performance throughout the year. 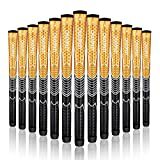 Should I buy a complete grip set for all of my clubs or individual grips? You can often save a bit of money by buying a complete set of 13 grips for all of your clubs aside from the putter. Is this the right thing to do? If you’re doing the annual beginning-of-the-year re-gripping on your whole bag, this is a great idea. I always recommend that you find the grip and size that works for you and put it on all your woods and irons. This consistent feel across your whole golf bag will help you feel comfortable no matter what club you’re hitting; every one will feel the same in your hands. This helps you achieve consistent release of the clubhead. Purchasing individual grips is useful if you tend to practice with just a few clubs. I have many students who spend 90% of their time practicing their short game, so their wedge grips wear out much faster than their less-used 4 irons. For these players, I suggest replacing their wedge grips several times per year and letting the less-used grips go a little bit longer between re-grippings. You may also find that you use your driver 14 times per round, but you only hit a 3-wood or 4-iron two or three times per round. For this reason, I suggest replacing your driver grip and the grip of any of your go-to clubs that regularly get used the most more often. The last circumstance in which you may want to purchase individual grips instead of a grip set is if you’re not happy with your current grips but you can’t pinpoint why. You may want to buy several difference sizes, styles, or brands of grips and try them out before committing to a whole set for every club in your bag. How do I properly maintain my grips to make them last longer? You can extend the life of your golf grips by keeping them clean and dry, and storing them in a dry, room temperature environment. The top degraders of tackiness in golf grips are oils from your hands and hot, damp environments. To properly clean your grips, use a soft scrub brush and mild dish soap. Scrub the grip all over with the soapy water and dry them off with a towel. Lay them out to completely dry before using them again. It’s best to store your golf clubs in a cool, dry environment. So don’t leave them outside in the trunk of your car where they can get overheated and wear out faster! 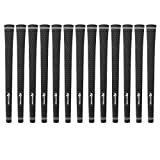 How do I change golf grips? The vast majority of golfers have their grips re-gripped by a clubmaking professional, either at a major retailer, a mom-and-pop golf shop, or at their local golf course. However, it’s not too difficult to do it yourself! All you need is a tool to remove the old grips, grip tape, a bit of solvent, and a golf tee. Use one of these specialty golf grip removal tools to get the old grip off, then scrape off any tape and residue from the top of the shaft. Apply new grip tape in a spiral candy cane shape from the bottom to the top of the shaft, finishing with a bit of tape over the top of the shaft to help in sliding the new grip on. Next, put a golf tee in the small hole at the end of the new grip, then pour some grip solvent into the new grip, swishing it around to coat the inside. Hold the taped end of the shaft over a sink or pan and pour the excess solvent from the grip over the tape, rotating the shaft to get full coverage of solvent on the tape. Align the grip properly and squeeze the end so it fits over the fat end of the shaft. Once it’s on, the solvent helps the grip slide right on. Make sure you don’t stretch the grip down the shaft unless you’re actively trying to make it skinnier than it’s designed to be. Slide the grip down the shaft until it’s all the way on and wipe off the excess solvent that’s squeezed out. Make sure the grip is aligned how you want it and isn’t twisted. You should always allow the grips to rest overnight before using them, as the solvent needs time to cure and dry. They should be ready to go within 2-4 hours, but I like to err on the side of caution. The grip is the only point of contact between your body and the golf club. If you don’t start with a good grip, you’ve got no foundation upon which to build a good swing. In my opinion, it’s one area of equipment where you really shouldn’t skimp. The price difference between the best in the industry and the bargain basement grips isn’t extreme, but the difference in performance and feel is noticeable. The Golf Pride New Decade Multi-compound MCC Plus4 Standard Grip is our pick for top performer whether you’re brand new to the game or a club champion scratch golfer. The combination of technology, craftsmanship, materials, and performance makes it a clear winner in my testing.